NEW Neal's Yard Remedies REHYDRATING ROSE FACIAL OIL 1.01 Oz NORMAL SKIN 30 ML! This listing is for a NEW 1.01 oz (30 ml) bottle of Neal's Yard Remedies REHYDRATING ROSE FACIAL OIL for normal skin! This bottle is sealed, includes the dropper and is in the original box. The BBE date (Best By) is 02/18. Please see my photographs for details. All of my items are from my smoke-free home. THANKS FOR LOOKING!!! Please note: Returns must be new/unused or in the original selling condition. All returns will be charged a 20% restocking fee unless there is an error in my listing or the item is defective. 5 out of 5 stars - NEW Neal's Yard Remedies REHYDRATING ROSE FACIAL OIL 1.01 Oz NORMAL SKIN 30 ML! 1 product rating1 product ratings - NEW Neal's Yard Remedies REHYDRATING ROSE FACIAL OIL 1.01 Oz NORMAL SKIN 30 ML! Description Replenishes and restores radiance to NORMAL SKIN Precious damask rose infuses a luxurious combination of organic skin-nourishing oils, rich in essential nutrients, antioxidants and vitamins, to help replenish moisture levels and boost skins natural radiance. 99% organic. Ideal for a skin conditioning facial or body massage, either as it is or tailored using your favourite essential oils, blends or other base oils. Shake the bottle before use and apply a small amount of oil to one palm. BRAND NEW & UNOPENED, NEAL'S YARD REMEDIES REHYDRATING ROSE FACIAL OIL. 30ML. Radiance for normal skin. Contains no synthetic colours or fragrances. 99% Organic ingredients. Batch number 1901102. Best before the end of 09/20. Ideal as a gift, or to treat yourself. 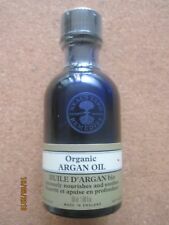 BRAND NEW & SEALED, NEAL'S YARD REMEDIES ORGANIC ARGAN OIL. 50 ML. 1.69 FL. OZ. Oz.Intensely nourishes and soothes. Nourrit et apaise en profondeur. Contains no Mineral Oils or Parabens. 100% Organic. Batch Number 1811291. Best before the end of 11/20. Ideal as a gift, or to treat yourself. BBE 06/19. Condition is New. A rich and nourishing face oil to calm and soothe your skin. A nourishing face oil to calm and soothe your skin. Herbal infusion with: Marshmallow Root, an anti-inflammatory herb, good for relieving puffiness and redness. Neal's Yard's 100% organic, skin-nourishing massage oil is a beautifully aromatic. Mother's Massage Oil. Perfect for giving a relaxing massage. then massage into skin. Also great for massaging stretchmark-prone areas. Rejuvenating frankincense facial oil. Clinically proven to moisture for up to 12 hours. Helps to reduce to appearance of fine lines and wrinkles. With intensely nourishing omega-rich oils. Same price per gram as full size so good to take on holiday or for freshness purposes etc. Tone and hydrate to rejuvenate your skin with this beautiful, refining collection, with the relaxing aroma of frankincense. Rejuvenate Your Beauty. MassageRejuvenating Frankincense Refining Cleanser into dry skin. Apply daily to freshly cleansed and toned skin.